Title page of the 1615 edition. The Spanish Tragedy, or Hieronimo is Mad Again is an Elizabethan tragedy written by Thomas Kyd between 1582 and 1592. Highly popular and influential in its time, The Spanish Tragedy established a new genre in English theatre, the revenge play or revenge tragedy. Its plot contains several violent murders and includes as one of its characters a personification of Revenge. The Spanish Tragedy is often considered to be the first mature Elizabethan drama, a claim disputed with Christopher Marlowe's Tamburlaine, and has been parodied by many Elizabethan and Jacobean playwrights, including Marlowe, William Shakespeare and Ben Jonson. Lord Strange's Men staged a play that the records call Jeronimo on 23 February 1592 at The Rose for Philip Henslowe, and repeated it sixteen times to 22 January 1593. It is unlikely, however, that the performance in February 1592 was the play's first performance, as Henslowe did not mark it as 'ne' (new). It is unclear whether Jeronimo was The Spanish Tragedy, or The First Part of Hieronimo (printed in 1604), the anonymous "prequel" to Kyd's play, or perhaps either on different days. The Admiral's Men revived Kyd's original on 7 January 1597, and performed it twelve times to 19 July; they staged another performance conjointly with Pembroke's Men on 11 October the same year. The records of Philip Henslowe suggest that the play was on stage again in 1601 and 1602. English actors performed the play on tour in Germany (1601), and both German and Dutch adaptations were made. The Spanish Tragedy was performed at London's National Theatre, first in 1982 at the Cottesloe Theatre, with Michael Bryant in the role of Hieronimo, directed by Michael Bogdanov. It transferred to the Lyttelton Theatre in 1984. The Royal Shakespeare Company performed The Spanish Tragedy in May 1997 at the Swan Theatre, directed by Michael Boyd. The cast included Siobhan Redmond as Bel-imperia, Robert Glenister as Lorenzo, Peter Wright as Hieronimo, Jeffry Wickham as the King of Spain. The production later transferred to The Pit at London's Barbican in November 1997. An amateur production of The Spanish Tragedy was performed 2–6 June 2009 by students from Oxford University, in the second quad of Oriel College, Oxford. Another amateur production was presented by the Hyperion Shakespeare Company 21–30 October 2010 with students from Harvard University in Harvard's New College Theatre. In November 2012, Perchance Theatre in association with Cambridge University's Marlowe Society staged a site-specific production in King's College Chapel, Cambridge. In October/November 2013, the Baron's Men of Austin, TX performed the work in a near-uncut state, with period costumes and effects, at Richard Garriott's Curtain Theater, a mini replica of the Globe Theater. Another amateur production was presented by the Experimental Theater Board of Carleton College 27–29 May 2015. Other professional performances include a modern-dress production staged at the Arcola Theatre in London in October–November 2009, directed by Mitchell Moreno, with Dominic Rowan as Hieronimo, as well as a production in Belle Époque era costume, staged by Theatre Pro Rata in Minneapolis in March 2010, directed by Carin Bratlie. The play has never been filmed or staged on television. In the "Induction" to his play Bartholomew Fair (1614), Ben Jonson alludes to The Spanish Tragedy as being "five and twenty or thirty years" old. If taken literally, this would yield a date range of 1584–1589, a range that agrees with what else is known about the play. The exact date of composition is unknown, though it is speculated that it was written sometime between 1583 and 1591. Most evidence[clarification needed] points to a completion date before 1588, noting that the play makes no reference to the Spanish Armada, and because of possible allusions to the play in Nashe's Preface to Greene's Menaphon from 1589 and The Anatomie of Absurdity from 1588–1589. Due to this evidence, the year 1587 remains the most likely year for completion of the play. Kyd's play was entered into the Stationers' Register on 6 October 1592 by the bookseller Abel Jeffes. The play was published in an undated quarto, almost certainly before the end of 1592; this first quarto was printed by Edward Allde — and published not by the copyright holder Jeffes, but by another bookseller, Edward White. On 18 December that year, the Stationers Company ruled that both Jeffes and White had broken the guild's rules by printing works that belonged to the other; both men were fined 10 shillings, and the offending books were destroyed so that Q1 of The Spanish Tragedy survives in only a single copy. Yet the Q1 title page refers to an even earlier edition; this was probably by Jeffes, and no known copy exists. The popular play was reprinted in 1594; in an apparent compromise between the competing booksellers, the title page of Q2 credits the edition to "Abell Jeffes, to be sold by Edward White". On 13 August 1599, Jeffes transferred his copyright to William White, who issued the third edition that year. White in turn transferred the copyright to Thomas Pavier on 14 August 1600 and Pavier issued the fourth edition (printed for him by William White) in 1602. This 1602 Q4 featured five additions to the preexisting text. Q4 was reprinted in 1610, 1615 (two issues), 1618, 1623 (two issues), and 1633. All of the early editions are anonymous. The first indication that the author of the play was Kyd was in 1773 when Thomas Hawkins, the editor of a three-volume play-collection, cited a brief quotation from The Spanish Tragedy in Thomas Heywood's Apology for Actors (1612), which Heywood attributes to "M. Kid". The style of The Spanish Tragedy is considered such a good match with Kyd's style in his other extant play, Cornelia (1593), that scholars and critics have universally recognised Kyd's authorship. In 2013, scholar Douglas Bruster theorised that some awkward wordings in the "Additional Passages" of the 1602 fourth edition resulted from printers' errors in setting type from the (now lost) original manuscript. Furthermore, after examining the "Hand D" manuscript (widely accepted as in Shakespeare's handwriting) from the play Sir Thomas More, Bruster opined that the speculated printers' errors could have resulted from reading a manuscript written by someone with Shakespeare's "messy" handwriting, thus bolstering the likelihood that Shakespeare wrote the Additional Passages. 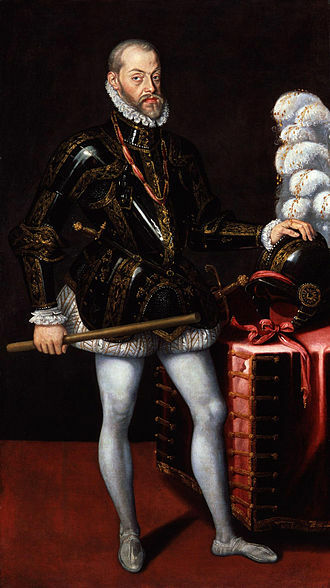 Before the play begins, the Viceroy of Portugal rebelled against Spanish rule. A battle took place in which the Portuguese were defeated and their leader, the Viceroy's son Balthazar, killed the Spanish officer Andrea before being taken captive by the Spanish. Andrea's ghost and the spirit of Revenge are present onstage throughout the entirety of the play and serve as chorus. At the beginning of each act, Andrea bemoans the series of injustices that have taken place and then Revenge reassures him that those deserving will get their comeuppance. There is also a subplot concerning the enmity of two Portuguese noblemen, one of whom attempts to convince the Viceroy that his rival has murdered the missing Balthazar. The King's nephew Lorenzo and Andrea's best friend Horatio dispute over who captured Balthazar. Though it is made clear early on that Horatio defeated Balthazar and Lorenzo has essentially cheated his way into taking partial credit, the King leaves Balthazar in Lorenzo's charge and splits the spoils of the victory between the two. Horatio comforts Lorenzo's sister, Bel-imperia, who was in love with Andrea against her family's wishes. Despite her former feelings for Andrea, Bel-imperia soon falls for Horatio. 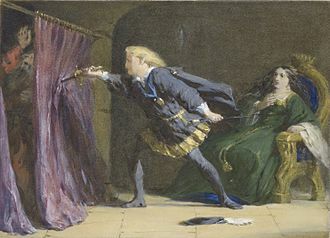 She confesses that her love for Horatio is motivated partially by her desire for revenge: Bel-imperia intends to torment Balthazar, who killed her former lover Andrea. Lorenzo locks Bel-imperia away, but she succeeds in sending Hieronimo a letter, written in her own blood, informing him that Lorenzo and Balthazar were Horatio's murderers. Hieronimo's questions and attempts to see Bel-imperia convince Lorenzo that he knows something. Afraid that Balthazar's servant Serberine has revealed the truth, Lorenzo convinces Pedringano to murder Serberine, then arranges for Pedringano's arrest in the hopes of silencing him too. Hieronimo, appointed judge, sentences Pedringano to death. Pedringano expects Lorenzo to procure his pardon, and Lorenzo, having written a fake letter of pardon, lets him believe this right up until the hangman drops Pedringano to his death. Lorenzo manages to prevent Hieronimo from seeking justice by convincing the King that Horatio is alive and well. Furthermore, Lorenzo does not allow Hieronimo to see the King, claiming that he is too busy. This, combined with his wife Isabella's suicide, pushes Hieronimo past his limit. He rants incoherently and digs at the ground with his dagger. Lorenzo goes on to tell his uncle, the King, that Hieronimo's odd behaviour is due to his inability to deal with his son Horatio's newfound wealth (Balthazar's ransom from the Portuguese Viceroy), and he has gone mad with jealousy. Regaining his senses, Hieronimo, along with Bel-imperia, feigns reconciliation with the murderers, and asks them to join him in putting on a play, Soliman and Perseda, to entertain the court. When the play is performed, Hieronimo uses real daggers instead of prop daggers, so that Lorenzo and Balthazar are stabbed to death in front of the King, Viceroy, and Duke (Lorenzo and Bel-imperia's father). Unfortunately, this also means that when Bel-imperia's character commits suicide, she also dies. Hieronimo tells everyone of the motive behind the murders, bites out his own tongue to prevent himself from talking under torture, and kills the Duke and then himself. Andrea and Revenge are satisfied, and promise to deliver suitable eternal punishments to the guilty parties. Many writers influenced The Spanish Tragedy, notably Seneca and those from the Medieval tradition. The play is ostensibly Senecan with its bloody tragedy, rhetoric of the horrible, the character of the Ghost and typical revenge themes. :27 The characters of the Ghost of Andrea and Revenge form a chorus similar to that of Tantalus and Fury in Seneca's Thyestes. :27 The Ghost describes his journey into the underworld and calls for punishment at the end of the play that has influences from Thyestes, Agamemnon and Phaedra. :33 The use of onomastic rhetoric is also Senecan, with characters playing upon their names, as Hieronimo does repeatedly. Hieronimo also references the Senecan plays, Agamemnon and Troades, in his monologue in Act 3, scene 13. 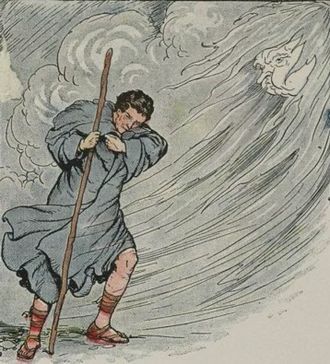 The character of the Old Man, Senex, is seen as a direct reference to Seneca. The play also subverts typically Senecan qualities such as the use of a ghost character. For Kyd, the Ghost is part of the chorus, unlike in Thyestes where the Ghost leaves after the prologue. Also, the Ghost is not a functioning prologue as he does not give the audience information about the major action on stage nor its conclusion. :33 The Ghost is similar to those in metrical medieval plays who return from the dead to talk about their downfall and offer commentary on the action. Revenge is akin to a medieval character that acts as a guide for those on a journey. The Spanish Tragedy was enormously influential, and references and allusions to it abound in the literature of its era. Ben Jonson mentions "Hieronimo" in the Induction to his Cynthia's Revels (1600), has a character disguise himself in "Hieronimo's old cloak, ruff, and hat" in The Alchemist (1610), and quotes from the play in Every Man in His Humour (1598), Act I, scene iv. In Satiromastix (1601), Thomas Dekker suggests that Jonson, in his early days as an actor, himself played Hieronimo. Allusions continue for decades after the play's origin, including references in Thomas Tomkis's Albumazar (1615), Thomas May's The Heir (1620), and as late as Thomas Rawlins's The Rebellion (c. 1638). In modern times, T. S. Eliot quoted the title and the play in his poem The Waste Land. The play also appears in Orhan Pamuk's 2002 novel Snow. The White/Pavier Q4 of 1602 added five passages, totalling 320 lines, to the existing text of the prior three quartos. The most substantial of these five is an entire scene, usually called the painter scene since it is dominated by Hieronimo's conversation with a painter; it is often designated III,xiia, falling as it does between scenes III,xii and III,xiii of the original text. Henslowe's diary records two payments to Ben Jonson, dated 25 September 1601 and 22 June 1602, for additions to The Spanish Tragedy. Yet most scholars reject the view that Jonson is the author of the 1602 additions. The literary style of the additions is judged to be un-Jonsonian;[by whom?] Henslowe paid Jonson several pounds for his additions, which has seemed an excessive sum for 320 lines. And John Marston appears to parody the painter scene in his 1599 play Antonio and Mellida, indicating that the scene must have been in existence and known to audiences by that time. The five additions in the 1602 text may have been made for the 1597 revival by the Admiral's Men. Scholars have proposed various identities for the author of the revisions, including Dekker, John Webster, and Shakespeare—"Shakespeare has perhaps been the favorite in the continuing search..."
Some critics claim that Hieronimo's attitude is what central Christian tradition calls the Old Law, the Biblical notion of an "eye for an eye". Hieronimo's passion for justice in society is revealed when he says, "For blood with blood shall, while I sit as judge, / Be satisfied, and the law discharg'd" (III.vi.35–36). The nature of murder and death, performed and as natural phenomena, is also questioned. Smith considers the decade of the play relevant to the use of hangings, murders, and near deaths throughout the play. Multiple characters are killed or nearly killed throughout the play. Horatio is hanged, Pedringano is hanged, Alexandro is nearly burnt at the stake, and Villuppo is assumed tortured and hanged. Kyd consistently refers to mutilation, torture, and death, beginning early in the play when the ghost of Don Andrea describes his stay in the underworld: "And murderers groan with never killing wounds, / And perjured wights scalded in boiling lead, / And all foul sins with torments overwhelmed" (I.i.68–70). He vividly describes in these lines as well as others the frequency of murder and torture in the underworld. Murder and death make up the tragedy theme that holds true through the last scene of the play. Another theme is social mobility-- characters such as Lorenzo and Pedringano are driven by their ambition and desire for more power. Pedringano especially so as he is a servant, belonging in the lowest rank of the hierarchy. His efforts to curry favor (and go beyond his 'place') with Lorenzo leads to his resulting downfall as he is barred from social mobility, a mere tool in the end. 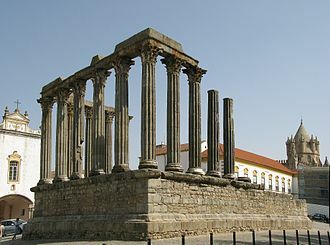 In addition to that, Hieronimo and his family are labeled as a "middling sort" by many scholars. Essentially the 'middle class,' Kyd establishes a situation in which conflict between Hieronimo's household and the nobility is inevitable as the middle class is seen as a threat, one that is pressing up on the aristocrats. This is evident in scenes such as the resulting competition from the 'middling sort' Horatio and Lorenzo, the King's nephew. Scholars cite oeconomia as the philosophy Kyd is adhering to in the play. The structure in essence is a "play within a play". The play begins with a background of why Hieronimo wants to seek revenge. He is seen as a minor character and eventually becomes the protagonist to add to the revenge plot. When he becomes the main character, the plot begins to unfold and become the revenge story that it is. Kyd incorporates the buildup to the revenge as a way to show the internal and external struggles of the characters. The actual revenge takes place during the play that Hieronimo stages, making this the climax of the play. The resolution is the explanation to the king of what has happened. The play within the play is not described until the actual play is performed, intensifying the climax, and the resolution is short due to the explanations that have already occurred. Critics say that The Spanish Tragedy resembles a Senecan Tragedy. The separation of acts, the emphasized bloody climax, and the revenge itself, make this play resemble some of the most famous ancient plays. Kyd does acknowledge his relations to Senecan Tragedies by using Latin directly in the play but also causes Christianity to conflict with pagan ideals. We also see Kyd's use of Seneca through his referencing three Senecan plays in The Spanish Tragedy. 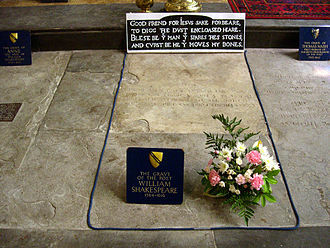 It is said that this play was the initiator of the style for many "Elizabethan revenge tragedies, most notably Hamlet". ^ Kyd, Thomas; Schick, Josef (20 October 1898). "The Spanish tragedy, a play". London, J.M. Dent and co. – via Internet Archive. ^ Rist, Thomas (2016). The Spanish Tragedy: A Critical Reader. University of Wales, Bangor, UK: Bloomsbury. p. 114. ISBN 978-1-4725-2773-8. ^ a b Chambers, Vol. 3, pp. 395–7. ^ "The Spanish Tragedy - National Theatre 1982". www2.warwick.ac.uk. ^ "National Theatre 1982 - Rehearsal Photographs". www2.warwick.ac.uk. Archived from the original on 4 March 2016. ^ "More matter, less art". The Independent. Retrieved 3 September 2018. ^ "The Spanish Tragedy - Professional Productions". www2.warwick.ac.uk. ^ "The Spanish Tragedy - Professional Productions". www2.warwick.ac.uk. Archived from the original on 13 September 2016. ^ "The Spanish Tragedie - Daily Info". Daily Info. Archived from the original on 27 May 2011. ^ "The Spanish Tragedy - Arts - The Harvard Crimson". 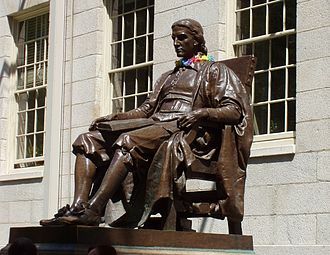 www.thecrimson.com. Archived from the original on 24 October 2010. ^ "The Spanish Tragedy - Student Activities - Carleton College". apps.carleton.edu. Archived from the original on 28 May 2015. ^ "Theatre review: The Spanish Tragedy at Arcola Theatre". www.britishtheatreguide.info. Archived from the original on 10 June 2011. ^ "Theatre Pro Rata". Theatre Pro Rata. Archived from the original on 3 February 2009. ^ "The Holloway Pages: Ben Jonson: Works (1692 Folio): Bartholomew Fair". hollowaypages.com. Retrieved 3 September 2018. ^ Corrigan, Brian. "Benjamin Jonson - Bartholomew Fair". University of North Georgia. ^ Heywood, Thomas (1841 report). An Apology for Actors in Three Books, pp. 45, 65. F. Shoberl, Jr. Retrieved 4 May 2014. ^ "Beyond "The Spanish Tragedy": the works of Thomas Kyd". TheTLS. Retrieved 17 April 2019. ^ Schuessler, Jennifer (12 August 2013). "Further Proof of Shakespeare's Hand in 'The Spanish Tragedy'". Archived from the original on 20 December 2016 – via www.nytimes.com. ^ a b c d Baker, Howard. "Ghosts and Guides: Kyd's 'Spanish Tragedy' and the Medieval Tragedy". Modern Philology 33.1 (1935). ^ Kyd, Thomas. The Spanish Tragedy. J.R. Mulryne, ed. London: A&C Black, 1989. ^ Eliot, T. S. The Waste Land, line 431: "Why then Ile fit you. Hieronymo's mad againe." ^ a b c d Justice, Steven. "Spain, Tragedy, and The Spanish Tragedy". SEL: Studies in English Literature 1500–1900, Vol. 25, No. 2, Elizabethan and Jacobean Drama (Spring, 1985), pp. 271–288. Published by: Rice University. 1 April 2009. ^ Smith, Molly. "The Theater and the Scaffold: Death as Spectacle in The Spanish Tragedy". SEL: Studies in English Literature 1500–1900, Vol. 32, No. 2, Elizabethan and Jacobean Drama (Spring, 1992), pp. 217–232. Rice University. ^ a b c Crosbie, Christopher. “‘Oeconomia’ and the Vegetative Soul: Rethinking Revenge in ‘The Spanish Tragedy.’” English Literary Renaissance, vol. 38, no. 1, Jan. 2008, pp. 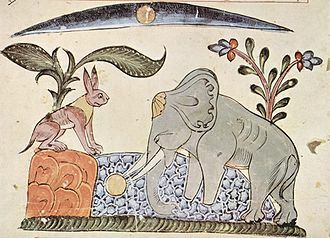 3–33. EBSCOhost, doi:10.1111/j.1475-6757.2008.00115.x. ^ a b Dillon, Janette. The Cambridge Introduction to Shakespeare's Tragedies. Cambridge University Press, 2007. Kyd, Thomas The Spanish Tragedy (London: Bloomsbury, 2013) ISBN 9781904271604. Edited with an introduction and notes by Clara Calvo and Jesús Tronch. Maus, Katharine Eisamann Four Revenge Tragedies (Oxford: Oxford University Press, 1998) ISBN 0-19-283878-4. Contains The Spanish Tragedy, The Revenger's Tragedy, The Revenge of Bussy D'Ambois, and The Atheist's Tragedy. Broude, Ronald. "Time, Truth, and Right in 'The Spanish Tragedy'". Studies in Philology, Vol. 68, No. 2 (Apr. 1971), pp. 130–145. Published by: University of North Carolina Press. 1 April 2009. Justice, Steven. "Spain, Tragedy, and The Spanish Tragedy". SEL: Studies in English Literature 1500–1900, Vol. 25, No. 2, Elizabethan and Jacobean Drama (Spring, 1985), pp. 271–288. Published by: Rice University. 1 April 2009. Kay, Carol McGinnis. "Deception through Words: A Reading of The Spanish Tragedy". Studies in Philology, Vol. 74, No. 1 (Jan. 1977), pp. 20–38. University of North Carolina Press. 1 April 2009. Benjamin Jonson was an English playwright, poet and literary critic of the 17th century, whose artistry exerted a lasting impact upon English poetry and stage comedy. He popularised the comedy of humours, Ben Jonson said that his family originally came from the folk of the Anglo-Scottish border country, which genealogy is attested by the three spindles in the Jonson family coat of arms. One spindle is a heraldic device shared with the Border-country Johnstone family of Annandale. Jonsons clergyman father died two months before his birth, his mother married a master bricklayer two years later, Jonson attended school in St. Martins Lane. Later, a family friend paid for his studies at Westminster School, on leaving Westminster School, Jonson was to have attended the University of Cambridge, to continue his book learning but did not, because of his unwilled apprenticeship to his bricklayer stepfather. According to the churchman and historian Thomas Fuller, Jonson at this time built a wall in Lincolns Inn. After having been a bricklayer, Ben Jonson went to the Netherlands. After his military activity on the Continent, Jonson returned to England and worked as an actor, as an actor, Jonson was the protagonist “Hieronimo” in the play The Spanish Tragedy, by Thomas Kyd, the first revenge tragedy in English literature. 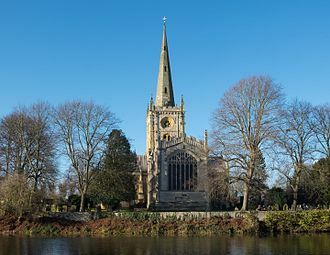 Regarding his marriage Jonson described his wife to William Drummond as a shrew, concerning the family of Anne Lewis and Ben Jonson, the St. Martins Church registers indicate that Mary Jonson, their eldest daughter, died in November 1593, at six months of age. Moreover,32 years later, a son, named Benjamin Jonson. By summer 1597, Jonson had an engagement in the Admirals Men, performing under Philip Henslowes management at The Rose. John Aubrey reports, on authority, that Jonson was not successful as an actor, whatever his skills as an actor. By this time Jonson had begun to write plays for the Admirals Men. 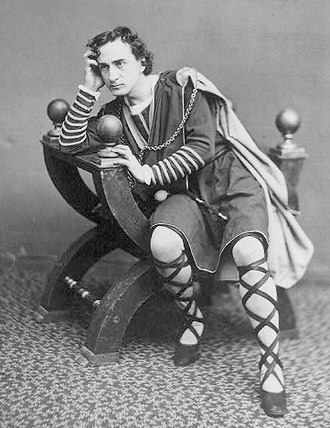 None of his early tragedies survive, however, an undated comedy, The Case is Altered, may be his earliest surviving play. Revenge is a form of primitive justice usually assumed to be enacted in the absence of the norms of formal law and jurisprudence. Often, revenge is defined as being an action against a person or group in response to a grievance. It is used to right a wrong by going outside of the law and this is because the individual taking revenge feels as though the law will not do justice. Francis Bacon described it as a kind of justice that does. Offend the law putteth the law out of office, primitive justice or retributive justice is often differentiated from more formal and refined forms of justice such as distributive justice and divine judgment. Detractors argue that revenge is simply wrong, of the design as two wrongs make a right. They dont want to lose face, some societies encourage vengeful behavior, which is called feud. These societies usually regard the honor of individuals and groups as of central importance, while protecting of his reputation an avenger feels as if he restores the previous state of dignity and justice. According to Michael Ignatieff, revenge is a profound desire to keep faith with the dead. Thus, honor may become a heritage that passes from generation to generation, whenever it is compromised, the affected family or community members might feel compelled to retaliate against an offender to restore the initial balance of honor that preceded the perceived injury. 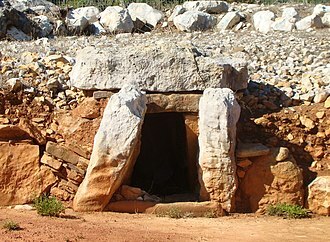 This cycle of honor might expand by bringing the family members and they still persist in some areas, notably in Albania with its tradition of gjakmarrja or blood feuds. Blood feuds are still practiced in parts of the world, including Kurdish regions of Turkey. Honoring ones family, clan, or lord through the practice of revenge killings and these killings could involve the relatives of an offender. Today, katakiuchi is most often pursued by means. The motto of Scotland is Nemo me impune lacessit, Latin for Nobody shall provoke/injure me with impunity, the origin of the motto reflects the feudal clan system of ancient Scotland, particularly the Highlands. 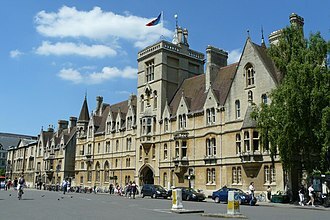 Oriel College is a constituent college of the University of Oxford in Oxford, England. Located in Oriel Square, the college has the distinction of being the oldest royal foundation in Oxford, in recognition of this royal connection, the college has been known as Kings College and Kings Hall. The reigning monarch of the United Kingdom is the official Visitor of the College, the original medieval foundation set up by Adam de Brome, under the patronage of Edward II, was called the House or Hall of the Blessed Mary at Oxford. The first design allowed for a Provost and ten Fellows, called scholars, and the College remained a body of graduate Fellows until the 16th century. During the English Civil War, Oriel played host to high-ranking members of the Kings Oxford Parliament, the College has nearly 40 Fellows, about 300 undergraduates and some 160 graduates, the student body having roughly equal numbers of men and women. Oriels notable alumni include two Nobel laureates, prominent Fellows have included founders of the Oxford Movement, among Oriels more notable possessions are a painting by Bernard van Orley and three pieces of medieval silver plate. In 1329, the college received by royal grant a large house belonging to the Crown, known as La Oriole and it is from this property that the college acquired its common name, the name was in use from about 1349. The word referred to an oratoriolum, or oriel window, forming a feature of the earlier property, the arrangement was cancelled in 1450. In 1643 a general obligation was imposed on Oxford colleges to support the Royalist cause in the English Civil War. The King called for Oriels plate, and almost all of it was given, the total weighing 29 lb.0 oz.5 dwt. of gilt, and 52 lb.7 oz.14 dwt. of white plate. In the same year the College was assessed at £1 of the sum of £40 charged on the colleges. 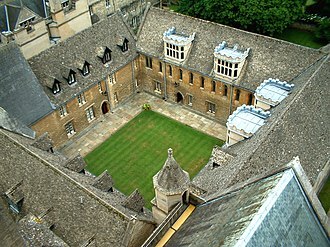 When the Oxford Parliament was assembled during the Civil War in 1644, Oriel housed the Executive Committee of the Privy Council, following the defeat of the Royalist cause, the University was scrutinised by the Parliamentarians, and five of the eighteen Oriel Fellows were removed. 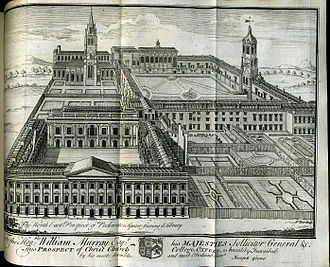 In 1673 James Davenant, a Fellow since 1661, complained to William Fuller, Bishop of Lincoln, Bishop Fuller appointed a commission that included the Vice-Chancellor, Peter Mews, the Dean of Christ Church, John Fell, and the Principal of Brasenose, Thomas Yates. Edward White was a London printer and stationer whose career spanned a period of over forty years. Between 1594 and 1611 he sold all three quartos of William Shakespeares Titus Andronicus, Edward White, born about 1548, was the son of a Suffolk mercer, John White of Bury St Edmunds. White began his career in 1565 as apprentice to William Lobley. By 1576 he was established to take on his brother, Andrew White. In succeeding years he is known to have had eleven other apprentices and he entered his first copy in the Stationers Register on 21 July 1577, The true history and faithful relation of a most horrible murder committed by Alphonse Diazius. On 7 April 1579 he entered Thomas Salters The mirror of modesty and he was admitted to the livery of the Stationers Company in June 1588. Although he never attained the office of Master of the Company, he served as warden in 1600. Whites output included a deal of popular literature. He either licensed, printed or sold some twenty plays, as well as three dozen ballads, and almost the same number of pamphlets, White died late in 1612 or early in 1613, his last entry in the Stationers Register bears the date 12 August 1612. His widow survived him, and with their son took over the printing business until her own death about 1615. 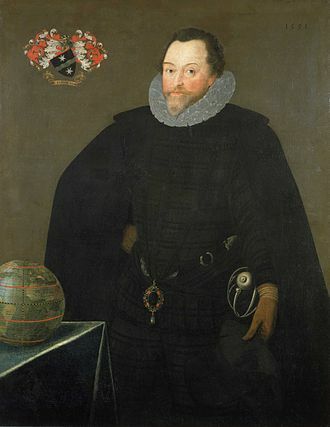 In 1619 John Grismand partly took over the business, Bishai suggests, White married Sara Lodge, daughter of Sir Thomas Lodge, Lord Mayor of London, by whom he had at least one son, named Edward White. Susan Lodge married Thomas Leicester of Worleston, works licensed to White in the Stationers Register and printed or sold by him include, Anon. 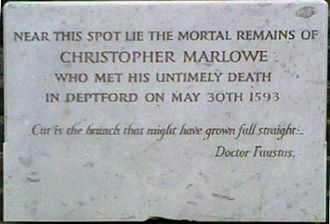 The true history and faithful relation of a most horrible murder committed by Alphonse Diazius, a doleful discourse or sorrowful sonnet made by one Edward Fallowes who lately suffered death at Saint Thomas Watering for a robbery. This song the qualities of the world doth show, Thomas, The mirror of modesty. A detection of damnable drifts practised by three witches arraigned at Chelsmford in Essex, a rehearsal both strange and true of heinous and horrible acts committed by Elizabeth Stile. A pleasant and speedy path for the bringing up of young children, dance, merry dance, come on and dance with beggary. The Rose was an Elizabethan theatre. 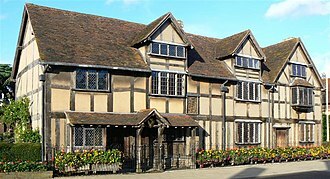 The Rose was built in 1587 by Philip Henslowe and by a grocer named John Cholmley and it was the first purpose-built playhouse to ever stage a production of any of Shakespeares plays. The theatre was built on a called the Little Rose. The Rose was the first of several theatres to be situated in Bankside, the area was known for its leisure attractions such as bear/bull-baitings, gaming dens and brothels. It was located in the Liberty of Clink, a liberty outside the jurisdiction of the City of Londons civic authorities, the Rose contained substantial rose gardens and two buildings, Cholmley used one as a storehouse, while Henslowe appears to have leased the other as a brothel. North of London, professional playhouses like the Curtain Theatre and The Theatre had already been open for over a decade, Henslowe recognized the ease at which audiences could ferry across the River of Thames and established a playhouse in this particular location. The theatre was built by the carpenter John Griggs, the new building was of timber, with a lath and plaster exterior and thatch roof. In shape it was a polygon, of about 72 feet in external diameter. The inner space was a polygon, about 47 feet wide. Henslowes documentation of the Rose Theatre has survived, and was placed in the library of Dulwich College by its founder, Edward Alleyn, Alleyn was the principal actor of the Lord Admirals Men. 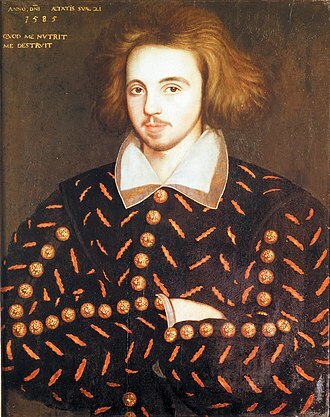 In May 1591, The Lord Admirals Men split off from the Lord Chamberlains Men and their repertoire included plays by Robert Greene and especially Christopher Marlowe, who became the theatres main playwright. Edward Alleyn married Henslowes step-daughter in 1592, and the two became partners, the plague took nearly 11,000 Londoners. The companies were forced to tour to survive, and some, like Pembrokes Men, from 1592 to 1593, the Lord Stranges Men performed on the Rose Stage. From 1593 to 1594, the Sussexs Men performed in its place, by the summer of 1594 the plague had abated, and the companies re-organized themselves. The Queens Men performed in 1594 and the Lord Admirals Men, still led by Alleyn, at their height, they performed three-hundred times, nearly thirty-six plays, twenty of which were new. The earliest texts of William Shakespeares works were published during the 16th and 17th centuries in quarto or folio format. Folios are large, tall volumes, quartos are smaller, roughly half the size, the publications of the latter are usually abbreviated to Q1, Q2, etc. where the letter stands for quarto and the number for the first, second, or third edition published. 18 of the 36 plays in the First Folio were printed in separate and The Two Noble Kinsmen appeared separately before their inclusions in folio collections. Six of these were classified bad quartos by Alfred W. Pollard, popular plays like 1 Henry IV and Pericles were reprinted in their quarto editions even after the First Folio appeared, sometimes more than once. Differing from the quartos of the plays, the first editions of Shakespeares narrative poems are extremely well printed, Richard Field, Shakespeares first publisher and printer, was a Stratford man, probably a friend of Shakespeare, and the two produced an excellent text. John Benson published an edition of Shakespeares Poems in 1640. The folio format was reserved for expensive, prestigious volumes and his poems were never included in his collected works until the eighteenth century. It was not until 1616, the year of Shakespeares death, seven years the folio volume Mr. William Shakespeares Comedies, Histories & Tragedies appeared, this edition is now called the First Folio. It contains 36 plays,18 of which were printed for the first time, because Shakespeare was dead, the folio was compiled by John Heminges and Henry Condell, and arranged into comedies and tragedies. The Folio is no more a definitive text than the quartos, many of the plays in the folio omit lines that can be found in quarto versions, and include misprints and textual corruption. The First Folio was compiled by Heminges and Condell — but it was published by a trio of stationers, William Jaggard, his son Isaac Jaggard, and Edward Blount. It contained, in addition to blandishments provided by various admirers of Shakespeare, such as the dedication signed by John Heminge, the Jaggards were printers, and did the actual printing of the book. It is thought that the printing of the First Folio was such a task that the Jaggards shop was simply needed to get the job done. The First Folio was reprinted three times in the 17th century, The Second Folio appeared in 1632, Isaac Jaggard had died in 1627, and Edward Blount had transferred his rights to stationer Robert Allot in 1630. The Second Folio was published by Allot, William Aspley, Richard Hawkins, Richard Meighen, and John Smethwick and it contained the same plays as the First Folio and much of the same additional material, with the addition of an unsigned poem by John Milton. The Third Folio was issued in 1663, published by Philip Chetwinde, Chetwinde had married Robert Allots widow, all seven of these additional plays had been published as quartos while Shakespeare was alive, but only Pericles was eventually widely accepted into the Shakespearean canon. The quartos of Pericles, The London Prodigal and A Yorkshire Tragedy were all attributed to William Shakespeare on their front pages, sir John Oldcastle was printed in 1619, three years after Shakespeares death, as part of the False Folio. William Shakespeare's will, written in a style of handwriting known as the secretary hand. This secretary alphabet is in a penmanship book by Jehan de Beau-Chesne and John Baildon published in 1570, when Shakespeare would have been five or six years old. This may have been the edition he studied as a child in grammar school. Model of The Rose in the Museum of London. City of Las Vegas Deputy City Marshals units parked just outside of the Fremont Street Experience. City Marshal of the City of London, on duty at the Lord Mayor's Show. Image: Three lines from the play, "Sir Thomas More"
Title page of Bartholomew Fair: A Comedy. The additional plays section in the 1664 second impression of the Third Folio. The Whole Contention Between the Two Famous Houses of York and Lancaster (1619), published by Pavier with William Jaggard as part of the False Folio of 1619.